This issue marks a bit of a watershed in my journey with The Flash because it’s the first issue following the end of my subscription. The subscription issues were folded vertically and mailed flat in a brown wrapper (seriously! ), and this is the first of my issues that doesn’t have a crease down the middle. I was a junior in college at the time and my attention was focused on breaking into the comics. That being said, I was doing precious little to help myself in that regard. I wasn’t taking full advantages of my art courses almost cutting them more than I attended them. I did spend quite a bit of time copying some of the pages from my favorite comic books which, I guess was something. I also, along with a friend, convinced the Daily Kent Stater to begin running a comic panel (namely ours) and for awhile our panels about college life alternated every other day in the paper. Humor strips weren’t my thing, however, and my focus remained on super heroes. To that end, I was taking classes of a sort. I was being home-schooled by Stan Lee whose class met at a place called the Kent Kozy Korner where I would find all of the latest comic books of the day. So all of this combined with my disillusionment over the departure of my favorite artists and writers from The Flash led me to just allow my subscription lapse. The book simply didn’t seem to matter as much as it once had. That being said, in a broad brush sense, issue #184, in some ways, would have fit in nicely with ones earlier in the run. It had as SF theme about a scientist from the far future reaching back and grabbing cities from the past to preserve in museum. A rather draconian departure from the the earlier issues where they would simply view events in the past as did Teacher Elider with his holographic movies of Central City in issue #116. 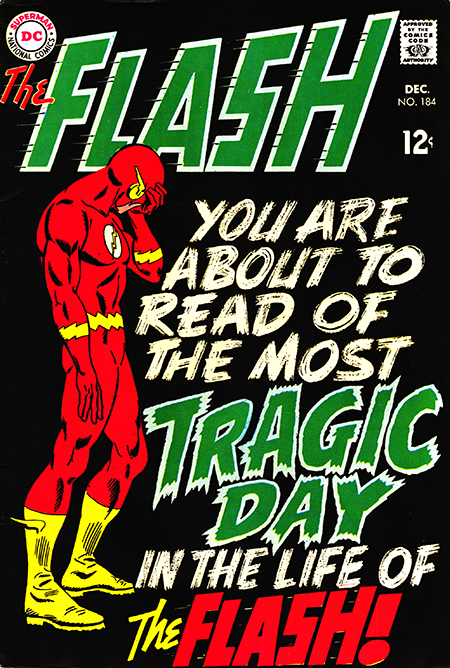 Flash’s “tragic day” comes from his thinking that he alone was responsible for the disappearance of Central City. But the resemblance ended there. The scientist from the future and the futuristic trappings are sad throwbacks to a kind of early fifties style that rather than convincing me that I was viewing the future, simply made me long for the the book’s previous elegant technical designs. And the writing continues to be a attempt to be hip and witty that undercuts the character of the Flash as we had come to know him. At one point, Barry refers to his wife as “Iris baby”, which came across as nothing short of jarring. The story itself is pretty solid, but these oppugnant elements only served to undercut it. Again, the letters page writers rail against what they see unfolding in their beloved magazine. Finally, just for the record, issue #116 was the issue that had kicked-off my sub.